Tooth discoloration, as the name suggests, is the staining of teeth. This can have a negative impact on the appearance of teeth and can also sometimes be harmful for the dental health. It is of three types: extrinsic, intrinsic, and a combination of both factors (age related issues). Drinks like coffee, wine, cola, etc do play a significant role in tooth discoloration. Some fruits and vegetables (like apple and potato) can also cause it. Use of tobacco and smoking also stain the teeth externally. People with poor dental hygiene are also more prone to teeth discoloration. Intake of high amounts of fluoride. Certain diseases affect the enamel and dentine which cause extrinsic and intrinsic tooth discoloration respectively. It can also be passed on from mothers to children, especially if the mother has certain infections during pregnancy. The discoloration can also happen with age as your enamel erodes away gradually. Some people are more prone to enamel wearing than others. This is genetically determined. Certain dental treatments like amalgam restorations contain substances that can lead to it. There are a few lifestyle changes that you can adopt to prevent tooth discoloration, or at least minimize the chances of it. Avoid drinking coffee, wine, other aerated drinks. Or do in moderation if necessary. Also avoid smoking or chewing tobacco products. Besides, maintain oral hygiene and brush and floss your teeth regularly. These simple changes will fairly reduce the chances of teeth discoloration. Using teeth whitening agents to remove or cover the stains. 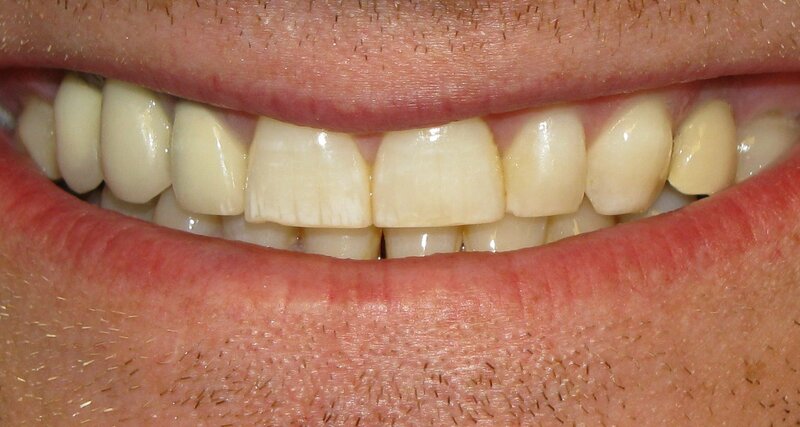 Veneers or dental crowns implanted on the surface of enamel also cover up the tooth discoloration. Bondings on enamel also hide the discoloration. In house and in office whitening agents are also available to cover up for it.